Exact Editions Blog | A New Web Services Approach for Exact Editions. Exact Editions is now showing a new face to publishers who are interested in using our services. This is really a matter of scaling up, since we are now working with hundreds of publishers and editors all of whom are looking for smoother, faster, simpler ways of being digital and delivering digital editions to their readers. An obvious way of speeding and simplifying this process is to start delivering a web services model for magazine publishers. The first step of this transition is to help publishers to set-up their own trial issue with a stream-lined sign-up procedure, and to give them the opportunity to explore the various services that they can select for their publication. We need to show examples, costs and benefits, and of course opportunities for feedback and dialogue. As the task of digital magazine distribution access gets ever more complicated, publishers are in need of solutions that can be ‘plug and play’, and Exact Editions attaches particular importance to providing ‘universal subscriptions’ that will help publishers to offer readers access across a multiplicity of platforms: print, web, Android, iOS and whatever else comes along. Users and publishers need plug and play solutions, and Exact Editions aims to support that both for reading platforms and for distribution options. So far as possible, one needs to offer the same (or a very similar solution) through every device, and we must help publishers to make that choice. 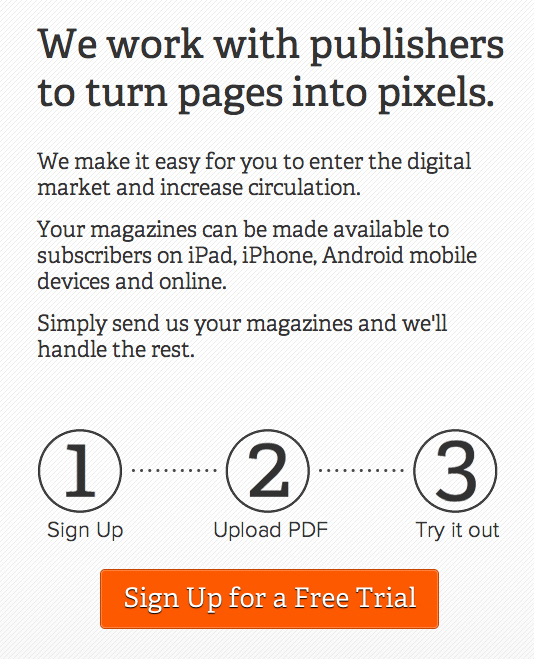 Starting with a trial issue we aim to make that a practical solution for publishers large and small.